Once, Hazrat Sultan ul Faqar Hazrat Sultan Bahu May Allah Sanctify his Secret reached a village while travelling and sightseeing. Here a Saint, Sher Shah Sahib lived. His highness was sitting in Muraqiba outside that town. Some Mureedain of Hazrat Sher Shah reached that place while collecting firewood. When one of those Seekers saw Hazrat Sultan ul Faqar Hazrat Sultan Bahu May Allah Sanctify his Secret , he came very near in order to talk with his highness and said 'Salaam'. His highness replied Wa Alaikum Salaam and when he gazed upon him during this phase of compliments, the heart of that Seeker became Current with the Zikr of Allah and every hair on his body started saying Allah Allah. That Seeker fell in his feet and started weeping and crying. When the other Seeker saw his condition, in order to know the reality of condition, he also came near his highness. When his highness gazed upon him, his condition also changed alike the first one and he also fell in his feet and started weeping. When the third Seeker noticed such condition of his friends, he was frightened and ran towards his Pir Sayyed Sher Shah and reported him that 'a Faqeer is sitting on a high place on ground and when the two Seekers went near him, God knows what happened to them that they are weeping and crying laying their head in his feet. When I heard their wailing aloud, I became nervous and ran here'. Hence, when Sher Shah heard this story, he decided to himself inspect along with some Seekers and Dervishes. When they reached near his highness , he hid his Inwardly Tawajuh and Spiritual Power from them. 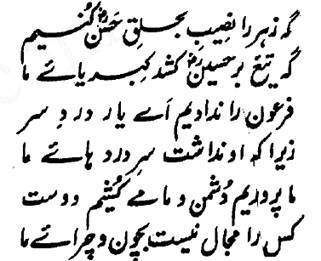 Hazrat Sher Shah bid Salaam to his highness and his highness replied.